Hello all my fellow craft storage enthusiasts!! It’s Hazel, all the way from Sunny SA. While the other side of the world are spring cleaning, we are “gathering” for the upcoming winter months. Whichever one you are doing, I think my post will inspire you to get organized while doing so. I know Craft Storage Ideas has done Ikea’s Raskog cart before but I just couldn’t miss this opportunity to show you how Christine Newman AK Listgirl adapted hers as a Project Life station. If you missed Laura’s original review on the cart, just click here. She filled the top tray with kits, date stamps, ink and pens. The scrapbook kit is organized into a clear upright paper sorter. If you want one, hop over to her post to get the link. The middle and bottom trays have Antonius divided organizers in them. The middle one is filled with 3×4 and 4×6 journal cards and cardstock, 6×6 paper pads, and washi tape. The Antonius has compartments that are PERFECTLY sized for the journal cards! The bottom tray is filled with various smaller pieces of labels and journal cards used for Project Life. You can find Christine’s original post here. Hop over to her blog to get links to all the products she used and to see the rest. She also converted her other cart (yes!!! She has two!!) into a mobile scrapping station while watching TV when it’s football season or too hot in her craft room. If you want to see what’s in that one, just click here. While at it, please leave Christine some comments to say Craft Storage Ideas sent you and thank her for coming up with and sharing these wonderful ideas with us. That’s it. I’m sure you are looking with new eyes at your Raskog cart. Have fun and please check back to Craft Storage Ideas as we have lots more to share right here. I’m so happy to introduce you to Marty Walden of Marty’s Musings. Marty has been blogging at Marty’s Musings since 2008 but only recently has managed to turn her DIY/home/food blog into a business. She has homeschooled her five children for 20 yearsa and loves DIYing with her husband Tim. My husband Tim and I spent several weeks talking through ideas for my scrapbook room. I scoured magazines and online websites for inspiration and dreamed of how I could make these ideas work for me. This is the main wall of my scrapbook room. My husband built the countertop and shelves according to my specific needs and scrapbooking supplies. My counter is waist high because I scrap and create standing up. There was much consternation over the exact height to make the counter! Luckily, we figured right and it is perfect! I bought a desk chair at a yard sale and it was a great buy and very comfortable. This ribbon rack is one of my favorite storage solutions! I adore ribbon and have far too many rolls that I have gotten at yard sales and craft stores. I wanted to be able to see as much of it as possible because it inspires me and I use it often on cards and layouts. My husband rigged the dowel rods and hooks. A perfect solution plus it’s pretty to look at! We also bought a twin bed with headboard from my niece and used a mattress and bedding we already owned. Drawers on the side give me more room for my ribbon stash! It seriously was taking over the world! My scrapbook room’s design ended up revolving around these two units I bought at Goodwill for $20 total (below). The unit had 6″x6″ cubbies with removable partitions. I removed several of them to allow the units to be used for 12×12 paper. Absolutely perfect solution for my massive collection! (I am slightly paper crazy.) This also allowed smaller compartments at the top for some of my other supplies. We put the cubbies on top of 4 units I bought at Target several years ago. 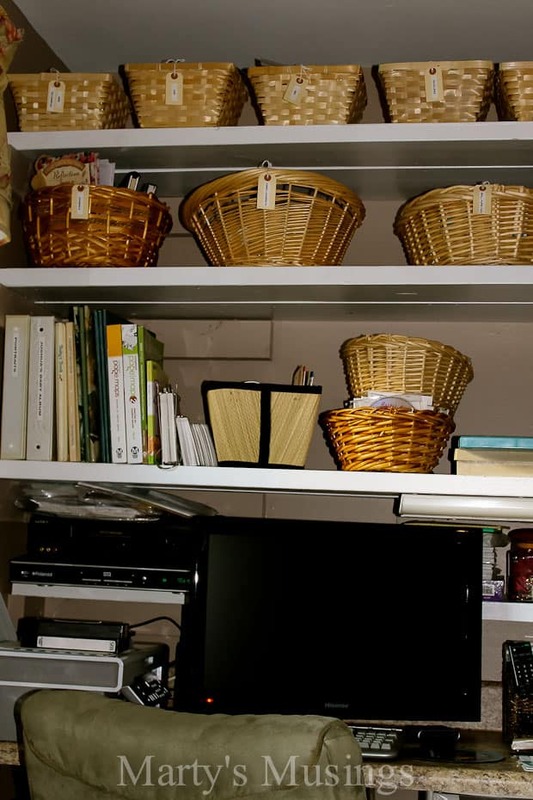 I love the look of open storage and accomplished that with these dollar store baskets and larger ones from yard sales. I used manila tags and a label maker on all of my baskets to keep everything organized. 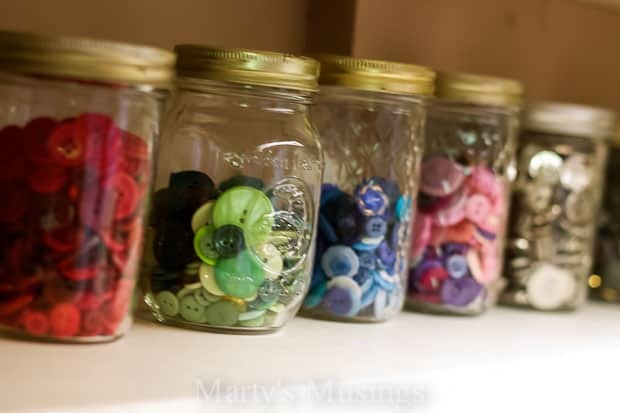 These smaller mason jars contain my button collection, separated by colors. I use everything from spice jars to quart size mason jars for ribbons, silk flowers, embellishments and more. 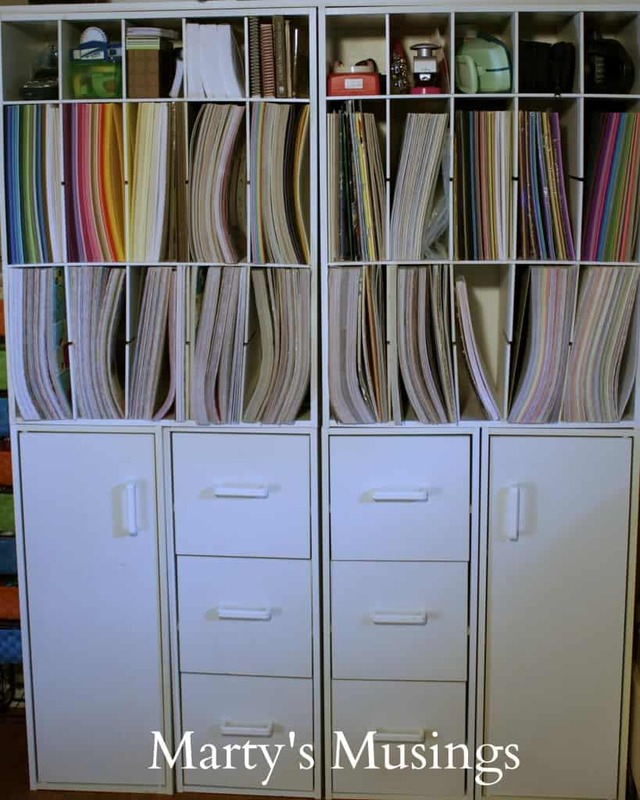 One of the ways I protect my scrapbook albums is to store them in a shelving unit near the front door. In case of a fire, I know what I will grab first! This post also tells more about how I organize my pictures and albums. I am a frugal shopper from way back, and I knew I wanted to save money while still creating a beautiful space for me to work. I shopped yard sales, thrift sales and the dollar store to save money wherever possible. We ended up spending a total of around $500 on the room makeover. Probably finding a way to store my growing collection of 12×12 paper! The cubbies we found at Goodwill worked perfectly. I definitely like to be organized, but as my blog has become a job I find I am making a greater variety of projects and need to find solutions for different products. I love labeling and want my room to be beautiful as well as functional. I am actually in the middle of a room makeover! I was not happy with the way I was using the space, and I needed to rethink how I actually spent my time in the room. I have moved some things around and am adding an area to shoot photos for my blog. Yes, my organization is always revolving to find a system that works for me! 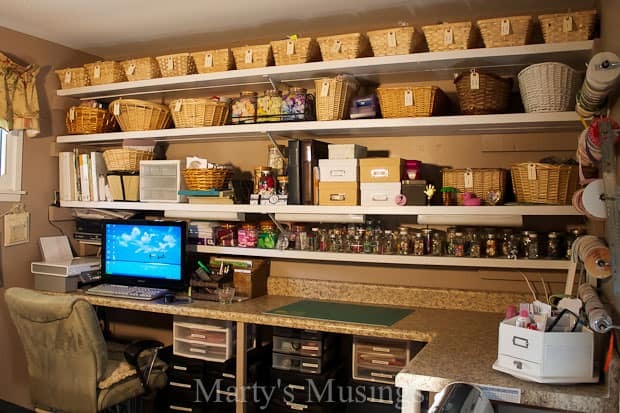 Did you see a organizational method you can put to use in your own space? I’m loving those shelves! To see more of Marty’s space and her work, please visit her at Marty’s Musings. Happy Tuesday! I’m so happy to introduce Celine Regnier to you all! When she first sent photos of her space – I just knew you would love seeing it as much as I did. She graciously agreed to share even more photos and write a little about her process, even though English is not her first language. Please give her a warm welcome! Let me introduce myself in a few words. I live in the Loire Valley area of France with my lovely husband, our two children, our cat Leo and our puppy Zoe. I began scrapbooking in 2003, since then I’ve become really addicted. I make layouts and mini albums mainly but also canvas, cards… scrapping is a very special moment with myself, pushing my creativity to express myself through stamps, inks, mist and paper. I also serve on the design team for Making Memories & Colorbök, Le club des 5 (Bernadine Segui), Saracolas Boutique (a french company), The Scrapbook Diaries and have been a guest designer for 7 Dots Studio and Prima Marketing. I am excited to share my creative area with you today. My room is like a “boudoir”, a kind of private room, only for me and my creative mind, a room to paint, to sew, to get messy or to watch an online workshop. When I close the door, no one can imagine the big mess behind the door! I didn’t spend a lot of money, fortunately (or not) I like to spend time at flea markets around here and it was a great pleasure to restore some stuff, every piece of furniture in my space room is from an another room or from flea markets, it’s like give them a second life. My greatest challenge was the large amount of crafting supplies that I have, I had to make them all fit in an organized way into a small room. I rarely re-organize my space, it’s too much time. I just try to be organized, everything in it’s right place! In my room, I have many little places… one for sewing, one for inking…. I’d like to have more space (hahaha) but especially very good lighting, because I really like working at night and it would be more easier with better lighting. Isn’t her space soothing? I love the gray furniture throughout. I bet it provides the perfect background for scrapbooking papers and embellishments. Please visit Celine’s blog here! I’m excited to introduce Blayne White to you today! Blayne is an entrepreneur; work at home mom, wife, and owner of both a professional photography studio and her newest creation, My Digital ScrapRoom. ScrapRoom was born out of her love for photography and scrapbooking, and an overwhelming passion for helping others organize their tremendous libraries of digital photos. She lives and works at home with her husband, Bryan, and her two children, Alyx and Tristan (yes, from Legends of the Fall), and her two rescue dogs Daisy and Cuddles. She has been a scrapbooker for 19 years and loves how her hobby and passion have now become her work. 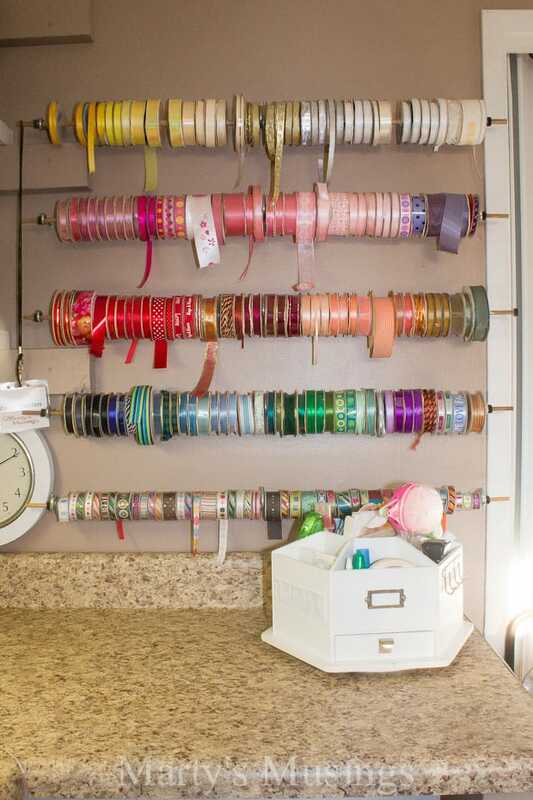 You are going to love her craft room. And don’t forget to check out the awesome coupon she’s offering to CSI readers at the end of this post! When it comes to scrapbooking, I am definitely a collector. I love to have the complete set of anything – paints, pens, die cuts, you name it. And that can cause a problem trying to store everything. Several years ago, my daughter and I turned an extra room at the front of our house into an art room. I was a little worried about it being the first room in our house that people see, but really, art is what we are all about, so I got over it. I love that I can be in the middle of everything going on and also creating, or organizing, whenever I have a few minutes. I have learned several things about myself when it comes to storage and how I use my ‘stuff’. I need to be able to see it, touch it, and find it in order to be inspired by it and use it. I use lots of clear and open storage in my space and find some of my favorite items at The Container Store and Ikea. 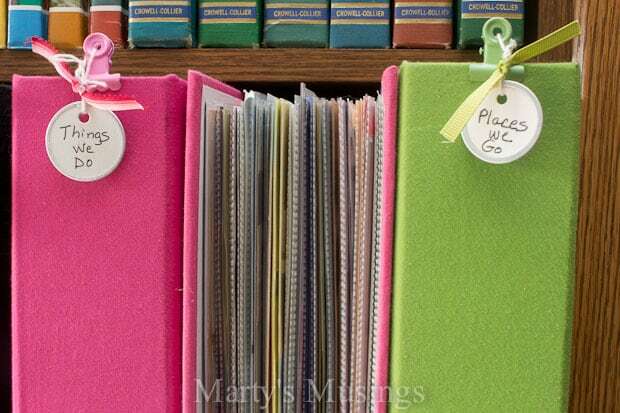 Because my scrapbooking organization is constantly changing and evolving, I don’t really have a budget in mind, but I am continually looking for items that are inexpensive or meaningful in some way. When we travel, I try to pick up a memento or container that reminds me of that place or time. For instance, on my desktop, I have a Butterbeer mug to hold my paintbrushes, a Pixar mug for my journaling pens, a George Michael mug for scissors, and an adorable glass vase from Anthropologie to hold Epiphany epoxies – all within reach, meaningful, and adorable at the same time. I also like to use supplies as the decor in my room – washi tape is in a wooden tray I found at a thrift store, and I also raided my kitchen for tiny sauce cups/ramekins for my new baker’s cart. This is my absolute favorite item at the moment. I saw one in Ali Edwards’ office when I visited her recently and found my own once I returned home. It has ten 18×24 removable trays and I store not only supplies, but also projects I’m working on. When I need something, I just grab it and place it on my worktable, then put it away to work on something else. It really helps keep my tabletop a little more clear. My favorite Ikea find is the little turquoise cart my friend Mary bought for me. It has wheels so it can go anywhere I want it to. I use this to store my paint, sticker letters, journaling cards and tags, stencil letters, ink pads, spray paints/inks, and stamping supplies. It doesn’t take up much space, but because of the vertical storage, it holds a lot. Along with organizing in open or clear containers, I also organize by color. I use color on my Clip It Up, as well as some clear plastic boxes I found at the Container Store, and of course, all my paper. The boxes are great for taking with me to a crop since they are portable and while I’d love to have all my embellishments in one spot, for now the two options are working for me. I have a problem with stamps. I love them, but I am bad about not using them. I found some cute little baskets trimmed in my favorite color – turquoise – at Target. I bought them without knowing how or even if I was going to use them. (Always, if you see something you love, buy all they have. You can always take it back.) I reorganized an Ikea printer cart for my stamps. I placed a cutting pad on top so I could stamp right where my stamps live, and stored my stamps in the new baskets below. I cut the snap closure off the Close To My Heart stamp cases (I know, I know – I had a hard time doing that! ), and I was able to fit THREE times as many stamps in a basket. I do not miss the snaps at all. My larger stamps are stored in clear snap folders in larger baskets. Again, with the clear storage, I can just flip through and quickly see what I have. I hope you have found some tips and tricks that help you in your own organizational journey. You can also visit my YouTube channel for more videos on organizing your supplies, as well as your photos. Isn’t Blayne’s room lovely? I especially love her baker’s cart. What a brilliant idea! Not only has she given us a peek into her craft room, but Blayne is also offering a sweet discount to CSI readers who are interested in using My Digital Scraproom. Just use code: craftstorageideasrocks for 20% off! This offer is good through July 31st! Update: Blayne has also posted a video tour of her space here.